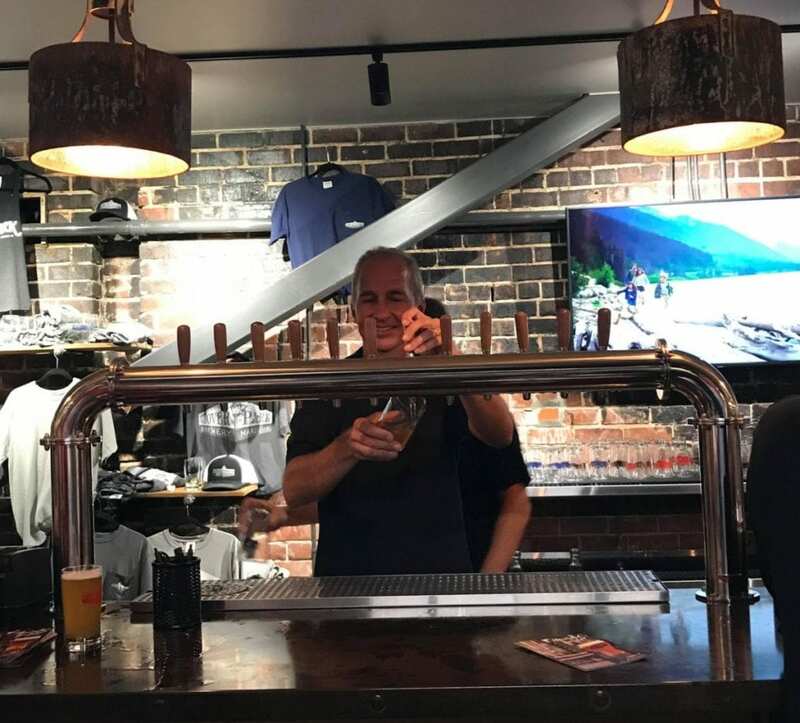 Marietta Square’s first craft beer brewing facility opened its doors to the public on Thursday, September 6, with an open house and party showcasing its event spaces and initial line of core beers. Named after the green space in the center of Marietta Square, Glover Park Brewery is located at 65 Atlanta St. at the intersection with Waverly Way, in a building that dates back to the 1930s and was formerly occupied by Marietta Lighting company. Co-founders and long-time Marietta residents Sam Rambo and Hank DuPre want their new brewery to be a small place in the neighborhood for people to get together with friends and family to hang out, watch sports and enjoy their fresh beer brewed on site. The building came close to burning down in November of 2001 when a basement electrical short started a fire that charred the brick walls. Rambo and DuPre refurbished the building earlier this year with an upstairs event space and a downstairs taproom layout set up for entertainment, with comfortable bar seating, large television screens, and games. Brewing machinery is visible on one side of the taproom, and the spacious and dog-friendly beer garden in the back offers a space for additional seating and food trucks. Some parking is available at the brewery, and a large public lot is right across the street. DuPre and Rambo have no prior experience in brewing beer, other than drinking a lot of it, but as savvy businessmen,\\\\ they felt the need to jump into the booming industry after the passing of Senate Bill 85 last year. They brought in SweetWater Brewing Company co-founder and former brewmaster Kevin McNerney, currently brewmaster of 5 Seasons Brewing as well as Glover Park Brewery, to craft the initial list of six core beers. Base Camp | Lager-style ale with a light color and body, brewed with traditional German malts and hops, smooth and crisp at 5.5 percent ABV. Square Groover | Golden ale with light color and body, sessionable with a subtle hop character at 5 percent ABV. Some Beach | Tropical IPA with lite body and subtle malt character, dominated by hop flavor and tropical citrus, sessionable but sneaky at 6.5 percent ABV. Off the Tracks | West Coast IPA with five varieties of hop character and bitterness, with a medium body and copper color, bitter and distinct at 7 percent ABV. Session Street | Saison Belgian Ale with high carbonation and a bitter lemon tartness, crisp and refreshing at 5 percent ABV. Can I get a Witness | Belgian Wit with a hazy and light body, hints of orange peel and coriander, refreshing and crushable at 5 percent ABV. Marietta Square has long been the site of large-scale events and festivals like the annual Fourth of July Celebration and monthly local artist markets. DuPre and Rambo said that there is already a lot of interest in the brewery as a venue for special events and weddings, with capacity for up to 300 guests. Their rental fee includes set-up, event time, breakdown, cleanup and use of all tables and chairs. The brewery is the latest to join a growing craft brewing community in Cobb County, which also includes Red Hare Brewing, Burnt Hickory Brewery, Ironmonger Brewing, Dry County Brewing Company, Viking Alchemist Meadery, and Treehorn Cider. A new brewery called Wise Owl Brewing is also in the works to open soon in Marietta. 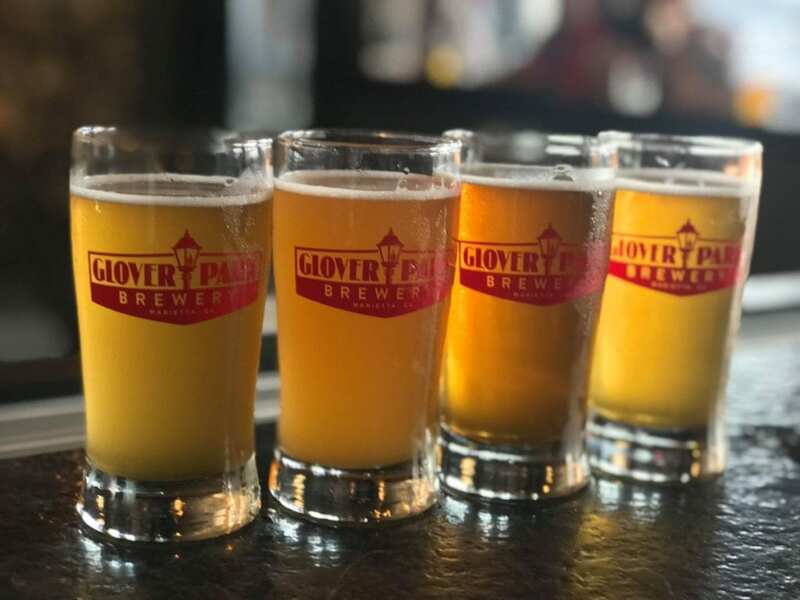 Like many professional breweries in Cobb County, Glover Park’s taproom will be closed Mondays and Tuesdays, but will open a 4 p.m. on weekdays, 11 a.m. on Saturdays and 12:30 p.m. on Sundays. It will close at 10 p.m. on Wednesdays and Thursdays, 11 p.m. on Fridays and Saturdays, and 7 p.m. on Sundays. Later this month on September 21, The Steven Brooks band will perform at the brewery. No one in the band is actually named Steven Brooks, but Brent Headley and Brandon Holland will play covers and original songs in the blues, rock and reggae genres to keep Glover Park Brewery’s opening month party going. 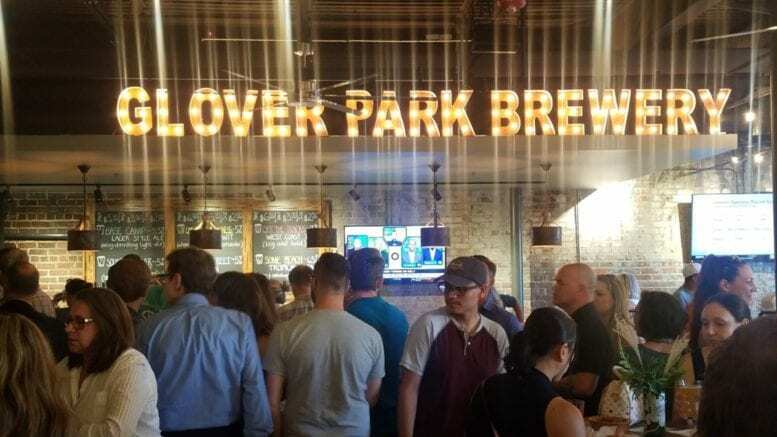 Be the first to comment on "Glover Park Brewery opens on Marietta Square"